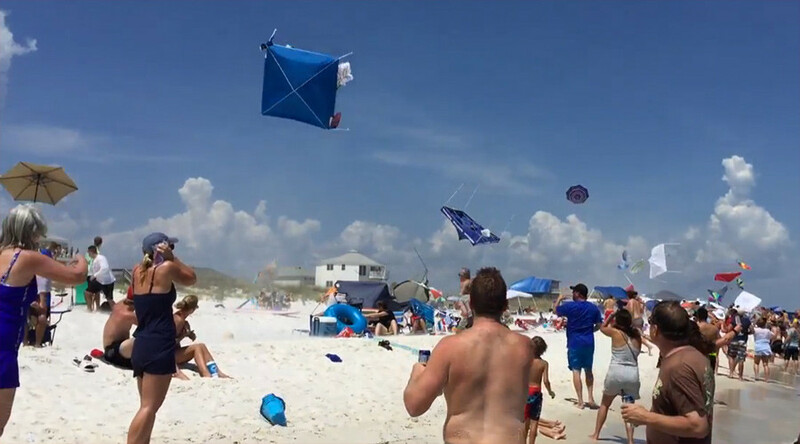 A daredevil Blue Angel supersonic plane has flown low and fast over Pensacola Beach, Florida, blowing away umbrellas and tents. The video shows two F/A-18 Hornet aircraft, one of them flying high above, and a second one hovering along the coastline – a lot nearer the ground. The air seemingly shakes and buzzes, as the plane passes by, and the wind blows away the tents and umbrellas way up high! People begin to run after the umbrellas – however, most of the beach goers laugh and cheer at the sight.